Objective The aim of this study is to assess the odds of caesarean section (CS) for uninsured women in the USA and understand the underlying mechanisms as well as consequences of lower use. Study design Systematic review and meta-analysis. Data sources PubMed, Embase, the Cochrane Library and CINAHL from the first year of records to April 2018. Eligibility criteria We included studies that reported data to allow the calculation of ORs of CS of uninsured as compared with insured women. Outcomes The prespecified primary outcome was the adjusted OR of deliveries by CS of uninsured women as compared with privately or publicly insured women. The prespecified secondary outcome was the crude OR of deliveries by CS of uninsured women as compared with insured women. Results 12 articles describing 16 separate studies involving more than 8.8 million women were included in this study. We found: 0.70 times lower odds of CS in uninsured as compared with privately insured women (95% CI 0.63 to 0.78), with no relevant heterogeneity between studies (τ2=0.01); and 0.92 times lower odds for CS in uninsured as compared with publicly insured women (95% CI 0.80 to 1.07), with no relevant heterogeneity between studies (τ2=0.02). We found 0.70 times lower odds in uninsured as compared with privately and publicly insured women (95% CI 0.69 to 0.72). Conclusions CSs are less likely to be performed in uninsured women as compared with insured women. While the higher rates for CS among privately insured women can be explained with financial incentives associated with private insurance, the lower odds among uninsured women draw attention at barriers to access for delivery care. In many regions, the rates for uninsured women are above, close or below the benchmarks for appropriate CS rates and could imply both, underuse and overuse. Extensive literature search, screening and data extraction performed in duplicate, review and analysis of study characteristics as well as thorough quality assessment of included studies. All studies are from one country, that is, the USA, and this limits the effect of contextual factors. A major limitation of our study is the variation across studies, in terms of the study populations characteristics, type of data used, types of caesarean section analysed and adjusting variables used in statistical analyses. The results of this study are driven by the largest study which contains over two-thirds of the population included in this review. Only 5 out of 16 studies included in the review report data after year 2000. While a population-level caesarean section rate of less than 9%, 10% or 19% suggests underuse, we cannot determine the mix of under, over and appropriate use in a specific population. Search words referring to CS, such as ‘caesarean section’, ‘caesarean delivery’, caesarean’, were combined with words referring to factors contributing to variation and increase of CS rates, such as ‘insurance’, ‘social class’, ‘socioeconomic’ and words referring to the study design, such as ‘geographical variation’, ‘medical practice variation’ (online supplementary appendix 1). No publication date or language restrictions were applied. We searched PubMed, Embase, the Cochrane Library and CINAHL from the beginning of records to the end of April 2018, when we last updated our search. A manual search was applied on the reference lists of included studies and previous systematic reviews. To be included in the analysis, studies had to report OR or data that enabled the calculation of OR of CS comparing uninsured against privately and/or publicly insured women. More specifically, we did not exclude studies based on any population characteristic. Studies had to report normal (vaginal) and CS deliveries with uninsured and privately and/or publicly insured comparisons. In an ideal situation, studies would report adjusted OR of uninsured as compared with privately and/or publicly insured women, but in cases, ORs were not calculated by the authors, we would extract data (rates and regression coefficients) and perform calculations that would allow for the derivation of OR. We did not exclude studies by type of study design, variables used for adjustment or any other study characteristic. Adjusted OR of deliveries by CS of uninsured women in comparison to insured women was the prespecified primary outcome. Crude OR of deliveries by CS of uninsured women in comparison to insured women was the prespecified secondary outcome. Papers screening and independent data extraction was done by two researchers (IH and MB). Differences were resolved based on consensus. We extracted data on study population, study design, data sources, setting, type of CS analysed, statistical analysis and (primary and secondary) outcome measures (online supplementary appendix 2). Standard inverse-variance random-effects meta-analysis was used to combine the overall ORs. An OR lower than one implies a lower frequency of CS in uninsured than in insured women. We calculated τ2 to measure heterogeneity between studies.41 Prespecified cut-offs of τ2 of 0.04, 0.16 and 0.36 were used to represent low, moderate and high heterogeneity between studies.42 Subgroup analysis by study design, period of data collection, state, type of CS analysed, parity, inclusion of women with previous CS, pregnancy risk of included women and level of (QUIPS) risk of bias was performed to examine between-study heterogeneity and X2 test was used to calculate p values for interaction among subgroups. Test for linear trend was performed in case of more than two ordered strata. All p values were two sided. STATA, release V.13, was used for analyses (StataCorp). We calculated CS rates among different insurance subgroups for the studies included in the analysis. No patients were involved in this study. We used data from published papers only. We identified a total of 1837 records: 1123 from PubMed; 556 from Embase; 39 from the Cochrane Library, 119 from CINAHL and 28 from manual search (figure 1). We removed 240 duplicates. A total of 1597 records were screened for eligibility. We performed full-text examination on 177 records. We excluded 139 that did not report insurance status of women43–181 and 26 that were otherwise irrelevant182–207 (online supplementary appendix 3). Finally, 12 records describing 16 separate studies20–22 62 208–215 including more than 8.8 million women were included in the review and meta-analysis. The flow diagram of review. Characteristics of studies are presented in table 1 and online supplementary appendix 4–7. All studies were from the USA. Thirteen studies were cross-sectional and three were retrospective cohort studies. Population size of studies ranged from 9017 to 6 717 486 cases. Studies used data from years 1986 to 2011 and most studies used hospital records data (online supplementary appendix 4). Case exclusion criteria varied considerably (online supplementary appendix 5) as well as variables studies used for statistical adjustment (online supplementary appendix 6). Online supplementary appendix 7 reports evaluation of studies using QUIPS risk of bias tool. Four studies were classified with low risk of bias, two studies with moderate risk, and 10 studies with high risk of bias (online supplementary appendix 7). 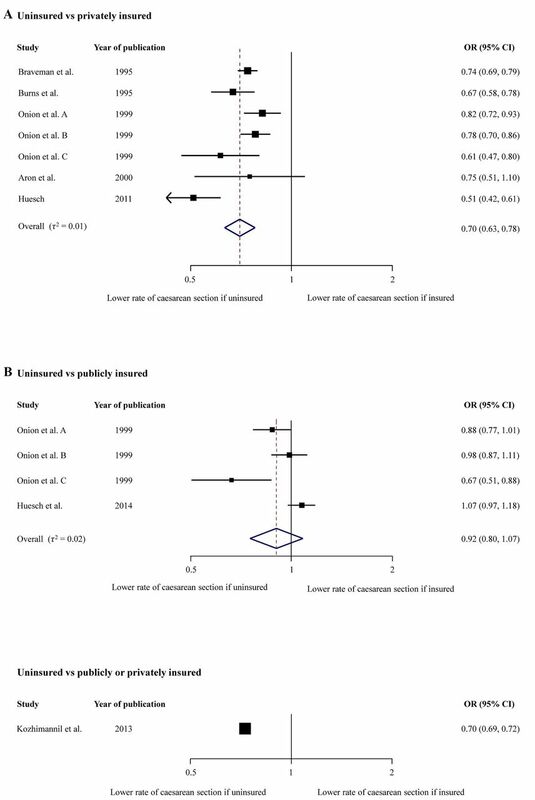 Figure 2 presents meta-analyses for primary outcome measure, that is, adjusted ORs of CS in uninsured women as compared with privately or publicly insured. Since there was a positive interaction between uninsured versus privately insured group and uninsured versus publicly insured group (p=0.016), we performed meta-analyses for each group separately. In the meta-analysis comparing uninsured with privately insured women, including seven studies in 556 454 women, we found that the odds of CS were 0.70 times lower in uninsured as compared with privately insured women (95% CI 0.63 to 0.78), with no relevant heterogeneity between studies (τ2=0.01). In meta-analysis comparing uninsured with publicly insured women, including four studies in 510 010 women, we found that the odds of CS were 0.92 times lower in uninsured as compared with publicly insured women (95% CI 0.80 to 1.07), with no relevant heterogeneity between studies (τ2=0.02). An additional study in 6 717 486 women, which did not distinguish between privately and publicly insured women,215 reported that the odds of CS were 0.70 times lower in uninsured as compared with insured women (95% CI 0.69 to 0.72). Adjusted ORs of caesarean section. Figure 3 presents results of subgroup analyses of adjusted ORs in uninsured versus privately insured women (Figure 3A) and in uninsured versus publicly insured women (Figure 3B). In the analysis of uninsured versus privately insured women, estimates varied for subgroups state (p for interaction <0.001), type of CS (p for interaction <0.001), parity (p for interaction=0.07), and pregnancy risk (p for interaction <0.001). There was no positive trend in the period of data collection subgroup. In the lower panel, which presents subgroup analyses of adjusted ORs in uninsured versus publicly insured women, estimates varied for subgroups period of data collection (p for interaction=0.03), state (p for interaction=0.004), type of CS (p for interaction=0.03), parity (p for interaction=0.03) and QUIPS risk of bias (p for interaction=0.03). Subgroup analyses for adjusted estimates. *P for trend. QUIPS, Quality In Prognosis Studies. In figure 4, we present meta-analyses for crude ORs of CS in uninsured as compared with privately or publicly insured women as secondary outcome. In the meta-analysis comparing uninsured with privately insured women, including 11 studies in 2 010 483 women, we found that the odds of CS were 0.71 times lower in uninsured as compared with privately insured women (95% CI 0.66 to 0.76), with no relevant heterogeneity between studies (τ2=0.018). 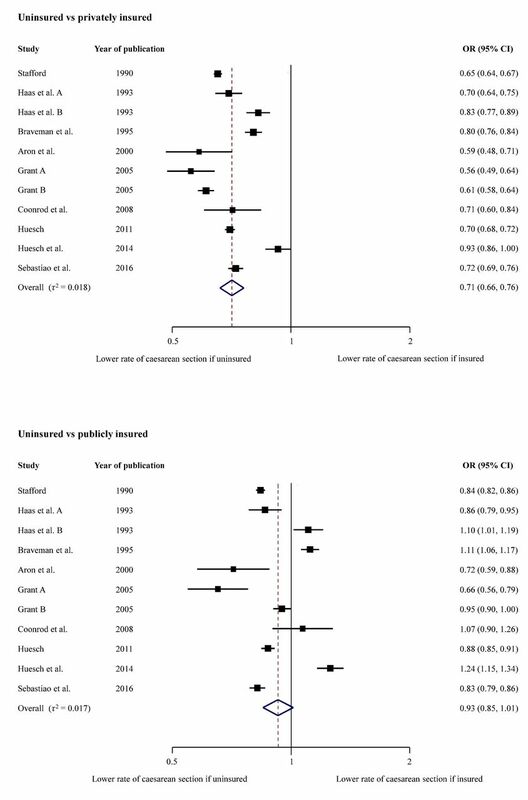 In the meta-analysis comparing uninsured with publicly insured women, including 11 studies in 2 010 483 women, we found that the odds of CS were 0.93 times lower in uninsured as compared with publicly insured women (95% CI 0.85 to 1.01), with no relevant heterogeneity between studies (τ2=0.017). Crude ORs of caesarean section. Table 2 presents rates of CS among groups with different insurance status for individual studies. Six studies found CS rates for uninsured women below the 19% benchmark. One study found CS rates below the 10% benchmark. The rates of other studies range from 19.3% to 23.0%, close to 19% benchmark. Our systematic review and meta-analyses estimated that the overall odds of receiving a CS are on average 0.70 times lower for uninsured women as compared with privately insured women (95% CI 0.63 to 0.78), 0.92 times lower for uninsured women as compared with publicly insured women (95% CI 0.80 to 1.07) and 0.70 times lower for uninsured women as compared with privately and publicly insured women (95% CI 0.69 to 0.72). The lower odds were noticed across all subgroups of studies in subgroup analyses as well as in crude analyses. The major strengths of our meta-analysis include an extensive literature search, screening and data extraction performed in duplicate, review and analysis of study characteristics as well as thorough quality assessment of included studies. In addition, all studies are from one country, that is, the USA, and this limits the effect of contextual factors. A major limitation is the variation across studies, in terms of the study populations characteristics (ie, parity, inclusion of women with previous CS, risk for CS), type of data used, types of CS analysed and adjusting variables used in statistical analyses. The results of this study are driven by the largest study which contains over two-thirds of the population included in this review. Only 5 out of 16 studies included in the review report data after year 2000. It should also be taken into consideration, that despite similar features, the uninsured are a diverse group of US citizens.26 27 We considered but could not make use of the Robson criteria to classify studies and analyse CS rates among the studies reviewed. Only 2 out of 16 studies could be classified using the Robson criteria.62 214 While a population-level CS rate of less than 9%, 10% or 19% suggests underuse, we cannot determine the mix of under, over and appropriate use in a specific population. Future studies should examine the association of a lack of insurance in pregnant women across healthcare markets with varying CS rates and assess if delivery outcomes were correspondingly worse, in the effort to investigate the presence of underuse of CS. CSs are less likely to be performed in uninsured women as compared with insured women. The lower odds are consistent in all subgroups and in crude analyses. While the higher rates for CS among privately insured women can be explained with financial incentives associated with private insurance, the lower odds among uninsured women draw attention at barriers to access for delivery care. In many regions, the rates for uninsured women are above, close or below the benchmarks for appropriate CS rates and imply both, underuse and overuse. Therefore, efforts to assess the delivery outcomes as well as policy options that could improve insurance coverage for women giving birth are important. We thank Doris Kopp and Beatrice Minder for their valuable help during development of the search strategy, Arjana Shala for her help with literature search and Hossein Meyer-Troeltsch and Rand Engel for their support with editing.
. Tracking medicine: a researcher’s quest to understand health care . 1st Edition. Oxford: Oxford University Press, 2011.
. Medical Practice Variations in Reproductive, Obstetric, and Gynecological Care: In.Medical Practice Variations. Boston, MA: Springer US, 2016:141–60. Appropriate technology for birth. Lancet 1985;2:436–7. OECD. Health at a Glance 2017: OECD Indicators: OECD Publishing, 2017.
. Health insurance coverage in the United States: 2016. Washington, DC: US Government Printing Office, 2017:P60–260.
. Variations in surgical rates in Quebec: does access to teaching hospitals make a difference?. CMAJ 1993;148:1729–36.
. Racial variations in cesarean section rates: an analysis of Medicaid data in Louisiana. J Public Health Manag Pract 1997;3:41–8.
. State variation in rates of cesarean and VBAC delivery: 1989 and 1993. Stat Bull Metrop Insur Co 1996;77:28–36.
. Spatial distribution of C-sections within the state of São Paulo. Revista da Associação Médica Brasileira 2014;60:419–23.
. Effect of academic affiliation and obstetric volume on clinical outcome and cost of childbirth. Obstet Gynecol 2001;97:567–76.
. Small area variations in health care delivery in Maryland. Health Serv Res 1995;30:295–317.
. Impact of labor induction, gestational age, and maternal age on cesarean delivery rates. Obstet Gynecol 2003;102:287–93.
. Assessing medical practices through PSRO cooperative studies, an evaluation of Cesarean births in nine PSRO areas. Med Care 1982;20:75–84.
. Cesarean section rates: time trends and comparisons among hospital sizes, census regions, and teaching and nonteaching hospitals. PAS Reporter 1975;13.
. Comparison of cesarean section rates in fee-for-service versus managed care patients in the Ohio Medicaid population, 1992-1997. Am J Manag Care 2001;7:134–42.
. Rethinking the cesarean rate: how pregnancy complications may affect interhospital comparisons. Med Care 2005;43:237–45.
. Unexplained variation in hospital caesarean section rates. Med J Aust 2014;200:84–5.
. Technology use, cesarean section rates, and perinatal mortality at Danish maternity wards. Acta Obstet Gynecol Scand 1994;73:240–5.
. Ten-year trends in Canada for selected operations. Can Med Assoc J 1982;127:23–7.
. Cesarean sections in France: impact of organizational factors on different utilization rates]. J Gynecol Obstet Biol Reprod 1997;26:484–95.
. Factors associated with hospital-specific cesarean birth rates. J Reprod Med 1989;34:407–11.
. The cesarean birth rate: influence of hospital teaching status. Health Serv Res 1991;26:325–37.
. Trends in cesarean section rates for the United States, 1970-78. Public Health Rep 1980;95:540–8.
. [On the hypothesis of cesarean birth rate stabilization in southeastern, Brazil]. Rev Saude Publica 1996;30:19–33.
. Rising caesarean section rates in public hospitals in Malaysia 2006. Med J Malaysia 2008;63:434–5.
. [Evolution of cesarean section rates in Spain: 1984-1988]. Gac Sanit 1994;8:209–14.
. Health maintenance organizations, independent practice associations, and cesarean section rates. Health Serv Res 1994;29:75–93.
. Five-year study of surgical rates in Ontario’s counties. Can Med Assoc J 1984;131:111–5.
. Financial incentives and use of Cesarean delivery: Taiwan birth data 2003 to 2007. Am J Manag Care 2012;18:e35–41.
. A study of cross-region admission and the distribution of regional inpatient care resources. Taiwan Journal of Public Health 2003;22:27–32.
. [Cesarean sections in Senegal: coverage of needs and quality of services]. Sante 1998;8:369–77.
. Infant mortality and low birth weight in cities of Northeastern and Southeastern Brazil. Rev Saude Publica 2003;37:693–8.
. Pro and con the trend to an increasing frequency of cesarean sections]. Akush Ginekol 1998;37:1–5.
. Deliveries in short-stay hospitals: United States, 1980. Adv Data 1982;83:1–11.
. Why is the caesarean section rate rising?. MIDIRS Midwifery Digest 2003;13:503–8.
. Caesarean section rates in government hospitals in Malaysia, 2000-2001. Med J Malaysia 2003;58:294–5.
. Small area analysis: descriptive epidemiology in health services research. Clin Perform Qual Health Care 1993;1:35–42.
. Midwife-led continuity models versus other models of care for childbearing women. 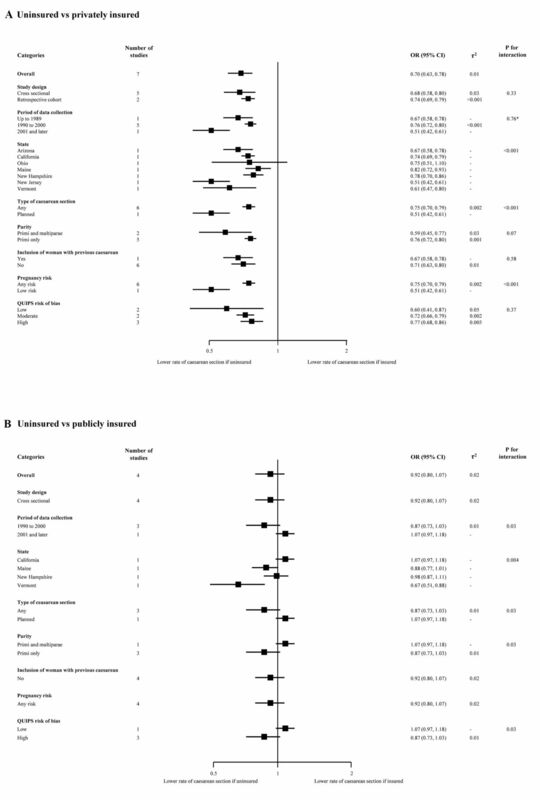 Cochrane Database of Systematic Reviews 2013;8 http://onlinelibrary.wiley.com/doi/.
. The high impact actions for nursing and midwifery. 7: Promoting normal birth. Nurs Times 2010;106:16–17.
. [Danish] Sectio caesarea-hvorfor varierer hyppigheden? Ugeskrift for laeger 1990;152:3143–4.
. Trends in hospital-based childbirth care: the role of health insurance. Am J Manag Care 2013;19:e125–32.
. Trends in cancer survival by health insurance status in california From 1997 to 2014. JAMA Oncol 2017. Contributors IH, DCG and PJ conceived and designed the study. IH and MB performed the data extraction and preparation. IH and LS analysed the data. IH, MB and LS drafted the paper, which was critically reviewed and approved by all authors. Data sharing statement No additional unpublished data are available from the study.